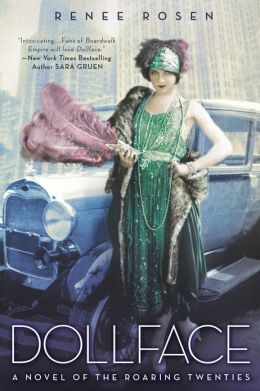 Vera wants to live the glamorous life of a flapper in Roaring 20s Chicago. She loves clothes, dancing, drinking and most of all- handsome, dangerous men. But the truth is, Vera is a poor Jewish girl working two jobs just to make ends meet. She lives with her best friend Evelyn in a run-down boarding house and skips meals because she can’t afford to eat. At night in speakeasies, Vera looks good enough to get the nickname “Dollface” but the truth is, her stockings are painted on. Vera thinks she’s incredibly lucky when she starts dating not one but two handsome men. Shep takes her on expensive dates, buys her gifts, and treats her well. Tony disappears for days at a time but he and Vera always reconnect with sizzling chemistry. Vera feels less lucky when she discovers that both of her lovers are gangsters- not only that, but they belong to rival gangs. At first, in horror, she breaks up with both of them. But she misses the romance as well as the fun times. Vera has to find out the hard way that there is a dark side to the glamorous life, especially when you’re funding it with a bootlegger’s purse. Vera ends up paying a far higher price than she ever thought she would for loving her two gangsters. This entry was posted in Fiction and tagged book review, fiction, flapper, prohibition, roaring 20s. Bookmark the permalink.